With exponentially increasing content on online media, and drastically decreasing attention span of viewers, how do you get noticed? In a blogosphere loaded with millions of bloggers, how do you stand out? How do you make a mark? How do you NOT get forgotten? Your “brand” is like your signature. It reflects on who you are, your personality, and the way you choose to project yourself to the community. At a glance, it tells your readers what to expect from your blog and how you are different from the rest. Here are a few things you can work upon to create a “brand identity” for your blog. What is your blog about? Do you post recipes? Or poems? Or stories? Or reviews? Or is it a personal blog about your life anecdotes? Think carefully. Choose a blog name that tells the reader what your blog is about. It’s the first thing people see when they visit your blog. So make it personal. Make it about you. Make it about your blog. Remember that thing about “first impressions”? That little image that shows up against your comments on other people’s blogs. Pick an avatar that lets people recognize you (or your blog). It could be your face (preferably a smiling one) or even your blog logo in case of niche blogs. Generic avatars don’t leave that deep an impression. These are a few, simple ways that you can use to create a brand identity for your blog. It would not only help in getting you noticed and remembered in the blogosphere, but would also create a consistency in the overall reader experience. Have you used any of these elements in creating your blog’s brand identity? Which ones? Do you recommend any other pointers for branding your blog? This is my second post for 2015 AprilAtoZ. 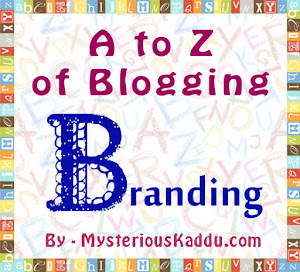 Link to the previous post: A to Z of Blogging: A - Arsenal. :) yeah. I agree. but it's good if u r self hosted or on blogspot if u want personalization like headers and colors and such. Wordpress free blogs don't offer that. Thanks, Leo! Will drop by shortly to see what you and Bhavya have written on today. Great pointers! I am laughing at the domain name example you shared. Agree on all counts. I guess the logo is now used as an alternative to the header for several blogs. I know when I join linkup parties, I leave my logo as it's my brand and is recognisable. Hmmm agree with vinay...and ur pointers will be really helpful to people who want to blog but dont know how to get started. This is the second blog post I have read on branding this morning, but this one really speaks to me personally about my own blog. I have been blogging for quite awhile, but haven't been able to find the key to getting a wide readership. I think your points are excellent and I'll be seeing how I can apply them. Nice post! This is something I definitely need to work on. I just kinda decided to run with it and learn as I do things, but I do need to make sure I'm recognizable. Now this is a super insightful blog post. I recommend this blog post to every new blogger. Too Good! Sanch, you have created a remarkable brand identity for your blog. I have learnt a lot from you!